Just when Bob is supposed to be getting better, seems like he has taken a step backwards. He’s pushed himself too hard, so typical of Bob. Now he feels sick, puking again, back hurts, thinks he has a hernia. When does this end? I realize I’m not the one who is physically suffering these things…but when does this end? I feel like running away. Aimie asked what I wanted for mothers day, I told her I think I want to be left alone. But not yet. Spoke to mom this morning, she didn’t sound quite right. Went to her house, she was a little “off”. Said her leg hurt, was numb. Then her arm was numb, then her lips. I did a quick neuro check…all good. She had an appointment at the hospital for her chemo (day 6 of 7), dad had just returned from airport picking up Rusty, we piled in the car and all went. Mom needed to ride up to the infusion center in a wheelchair. Not normal for her. Chemo went well, her blood counts showed that her calcium was low….could be reason for numbness. We gave her extra calcium tablets when she got home. She seemed a little better, still just very weak. Aimie, Paula, Rusty, dad, Nikki’s girls, Connor, Blake and I were all at her house. Said our prayers, sat with her, listening to praise and worship music, watching kids play. Mom went to bathroom, came out and was sort of stumbling….said something incoherently about passing out…then fell into the wall. Paramedics were there in what seemed like seconds, “We’re right around the corner” they said as they started assessing her. Mom was up in a chair getting vitals taken, telling us all that she would not go to the hospital before I could even wrap my head around what was happening. The ambulance left, and mom asked if we would make sure someone stayed the night. Paula, Aimie and I are here…staying. Rusty landed in Denver, went to the hospital with us, then was calling 911 all within 6 hours. After everything settled down, he and I drove to get food. He mentioned that the tension level was palpable….I told him that we’re all just on the edge. I have five siblings. We are all pretty different too I guess. Lately I’ve been trying to make sure that each of us are spending time with mom. I am the kid that feels she needs to have someone there every day, helping, cleaning up, cooking, making sure she’s drinking enough, etc. I guess if she were a bug I’d want to put her in a jar, feed her, talk to her, nurture her. I’m not sure that any of my siblings feel the same. I’m not saying that any of them are pulling her apart and squishing her guts out….I’m just saying that we are all different. Everyone has a different relationship with her, so of course we are all going to be different with her. I need to remember that just because my siblings aren’t the same as I am toward her….that doesn’t mean what they are giving her is any less important. I think she needs what she is getting from each of us. And for some, maybe it’s just consistency. Today was day two of chemo for mom. Aimie went with her, dad was there too. He’s there every day…every minute. He thinks it’s his job to be there every minute of her treatment. In sickness and in health, til death do them part. Though he is “losing his mind – crazy – driving me up a wall” according to mom; he is doing exactly what he is supposed to be doing. He is her husband. He is her partner. Crazy, losing his mind..good, good, man. He is there for her. Katie, Jordan and I went to dinner tonight. Ordered bread pudding for desert and took it to mom. We hung out with her for a bit. She told me that Bob had called her today. And told her that he loves her. Made me cry a bit. I don’t know why..I know he loves her. She cried a bit too. Bob’s not the most emotional person, meant a lot to her. Mom is getting decadron as a pre-med to her chemo. It’s a steroid that is administered to aid in anti-nausea treatment…and it also makes her feel GREAT. She is eating better and generally in a good mood due to the decadron. 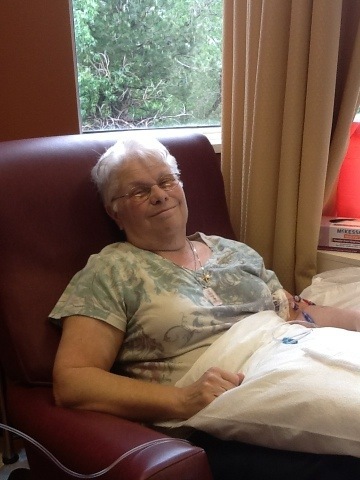 She told the nurses that she’d like decadron for mothers day. They said they’d take care of it for her. Decadron for mothers day….what a gift. Mom started her day by getting a new PIC line. Bob had his pulled last week…she got hers placed today. “For Christ’s sake…when will this end?” She says that a lot. I went to the doctors appointment and chemo with her today. Doctor says, “You look much better than your blood tests say you should!”. We told him we were ignoring the numbers…and just living one day at a time. He told mom, “It’s working for you, keep it up. We will pay attention to you and not your numbers”. I sort of had a bad weekend. I’m a bit crabby. “For Christ’s sake when WILL this end?” Just tired of it all. I’m confident that we will be okay…really I am. But wow, when do we get a break. Marilyn Hickey preached Sunday. The message was about God being attracted to our weakness. 2 Corinthians 12:10 -Therefore I take pleasure in infirmities, ….. For Christ’s sake. For when I am weak, then I am strong. So what really stuck with me was the “for Christ’s sake” part of that. I’ve read -and really feel that I’ve lived – the ‘when I am weak then I am strong’ part of that. I know that God is strong in me, stronger than me, shows up and lifts me when I’m weak, carries me through when I feel that I can’t walk it out, holds me, comforts me, and just basically is my strength when I feel that I have nothing left. But, I really never focused on the part about taking pleasure in infirmities for Christ’s sake. I don’t know if I’m there yet. I don’t know if I can take pleasure IN IT…maybe I’m still working on finding any pleasure during it. I mean, for Christ’s sake….I guess I can work on it. She still says she doesn’t think she’s going to die. She’s just sick of this crap. Agreed. “You know we go along and think everyone is doing so well and holding it together so well, and then something like this happens,” mom says after another one off us loses it. I’m with Aimie at church, we are in the lobby talking to some friends about mom. Aimie is so full of faith, so strong in her belief and statement of faith, then right in the middle of declaring our belief in mom being healed….she starts crying. She stops, cries a second, collects herself, takes a deep breath and starts speaking faith again. I’m constantly listening to dad blow a gasket (a full blown “I’m going to move away from this crazy state….no one knows what they’re doing… I’m getting a lawyer” to sue SOMEBODY) over things as trivial as the fact that he couldn’t find the Pringles at the grocery store. I guess I think that if I can’t control anything else in my world right now – at least I can clean it up. Just trying to hold it all together. For the most part I think we are doing really well, I just hope we don’t all ‘lose it’ at the same time. At least we can laugh at ourselves. Because of his strength will I wait upon thee: for God is my defense. Mom says she is waiting on God. God is her defense. God is her offense too. The word of God is our sword. When we hear that the tests aren’t lining up with our faith yet…we don’t doubt our faith. We don’t doubt our God. We wonder why, we get frustrated, we may even cry a bit….but we never doubt God. We pick ourselves up, go to the word of God — pick up our swords and fight again. We speak the word of God over and into this situation. All I keep hearing is, “Do you trust me?” Yes. The answer is yes. I trust you God. O LORD my God, in thee do I put my trust.